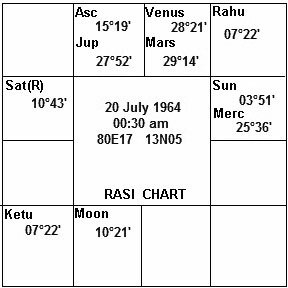 Horary is the branch of astrology, which deals with answering questions. 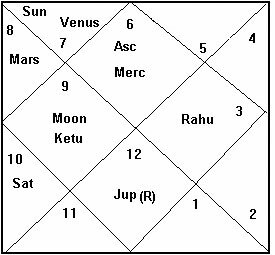 The astrologer can make predictions from these questions, by judging from a horoscope cast for the moment that the question is asked. One of the differences between Horary and other branches is its reliance on a simple set of rules. These rules are important in the judgment of the horoscope. No other branch of Astrology relies on rules to the same extent as Horary. The person who asks the question is called querent and the question is called query. 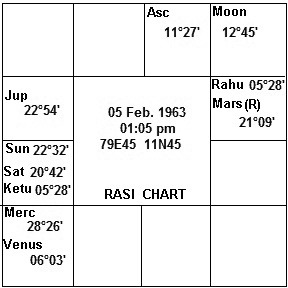 When a person meets (it may be in phone, WhatsApp or in any social media or in person) an Astrologer and expresses his question, the planetary positions for that moment (date and time) and for that place (the place where the Astrologer is) are calculated and the horoscope chart is drawn. There are some rules that usually decide the outcome to the questions. Sometimes, it may be necessary to seek further clarification from the querent. The astrologer will be aware of the deeper meanings. It is beautifully described by Varahamihir that, one should approach a learned Astrologer in the morning, with fruits, flowers, and money. Facing the East, making the curtesy salutation to the Astrologer, the querent should put only one question. But the accuracy, while still valid, will be upto the 7th question. There is a condition in a Horary chart that cautions against reading the chart, because it might not be fit to judge. A fundamental consideration is that, only sincere questions should be produced. Less than 3 degrees in rising sign, depicts a premature question. More than 27 degrees rising depicts a post-mature question. Moon or Asc in Via Combusta. (The area between 150 Libra and 150 Scorpio is termed the Via Combusta i.e. "Fiery Road") indiacates 'Not safe to judge'. Saturn retrograde in the 1st house means matters will generally not work out well. 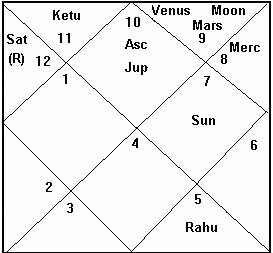 Saturn in the 7th house depicts Astrologer's judgment may be impaired, unless the question is about a seventh house subject. 7th house ruler, afflicted, means that Astrologer will have difficulty in answering the question. Moon, Void of Course, means that nothing will come out in the matter, unless the principal significators are very strong. The Moon may function, when Void of Course in Taurus, Cancer, Sagittarius, or Pisces. The Ascendant ruler being combust by the Sun means that the querent is quite worried, and the Astrologer may be working with inadequate information. If the Prasna Ascendant is Movable sign, there will be change in the present position. If the Ascendant is the Fixed sign, the position of Prasna will not be changed; If the Prasna Ascendant is dual sign, the results depend upon the degrees of the Ascendant. If the degrees are nearer to Movable sign, the results is Movable sign's; the degrees are nearer to Fixed sign, the result is Fixed sign's. If there is a relationship between Lagnesh (Lagna lord) and Karyesh (the Lord of the house, for which the Prasna is related), Prasna will give favourable results. The Movable sign behaves like Fixed sign and Fixed sign acts as Moveable sign, when natural malefic planets stays or aspects that sign. If there is favourable Tajika (discussed later) yoga between Lagnesh and Karyesh, the Prasna will be successful one. Lagna lord and Moon should be in good houses. The Prasna Ascendant and Natal Ascendant should be in good axis. Transfer or disturbance from one's position has to be determined from the Lagna, rising at the time. Success or prosperity can be seen from the 4th house. Absence from one's home is indicated from 10th house; return to his place from the 7th house. The positions of the several planets at the time of query, should be considered. The time of return will be synchronous, with the entry of a planet, into the 4th house. conjunction or aspect of the malefic, then only the "fall or occurrence" referred to above, will happen. Similarly the "occurrence" does not take place, when the Fixed sign is free from the aspect or conjunction of malefic planets. Will the occurrence happen or not in the case of Dual sign? If the sign is aspected by its lord or benefic aspect is much and the malefic aspect is less, the "fall" will come to pass else not. Similarly if the 4th house is Moveable and conjuncted with or aspected by its lord or a benefic planet, there will be acquisition of houses etc or else perish. Regarding the absence of a person, analyse the 10th house. If it is Moveable and conjoined with or aspected by a benefic, then there will be no absence. Similarly if the 7th house be so subjected, there will be no return from abroad. Otherwise if the 7th house is conjoined with or aspected by a benefic or it's Lord, return from abroad should be predicted. The number of days that have elapsed since his return, will correspond to the number of degrees progressed by the planet, in the 4th house. It may also happen that the person would return within so many days that are required by any planet which is coming to the 4th house. Whichever bhava is aspected or occupied by its lord or by any of the benefics, the prosperity of the bhava is ensured. But if the malefics should occupy or aspect any bhava, the destruction of the bhava would have to be predicted. Mars, the Sun, Saturn and the waning Moon are termed as malefics. Mercury, when conjoined with any of these, is inauspicious. The rest are benefic. Benefic posited in the several bhavas beginning with "Body" "Wealth" etc promote their prosperity, while malefics in the same position cause their decay. Benefics in the 6th destroy enemies. All planets, when occupying the 12th and 8th places, do not prove auspicious. The Moon with her digits full, if posited in lagna, will indicate the safe-return. When a benefic planet is in the lagna or its rising Navamsa is a benefic one and when the lagna or its rising Navamsa happens to be a Sheersodaya sign, success may be predicted. If the lagna be occupied by a malefic or if the rising Navamsa be owned by a malefic and if the rising sign or Navamsa be a Prishtodaya, failure will be the result. If it be mixed, we should say that success will result, only after great difficulty. 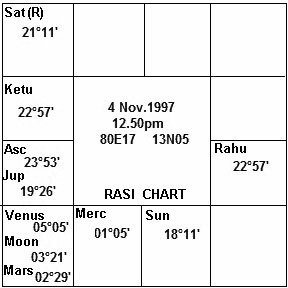 If malefic planets be rising in Sheersodaya sign, or if Prishtodaya Rasi is with benefic planets, success may be accomplished, only after a great deal of difficulty. If both benefic and malefic are there, after a careful comparison of the relative strength of the lagna concerned or its particular varga, result should be prediction. If retrograde natural benefic planets get the lordship of benefic houses, there will be repetition in the work done, to get benefic result. If retrograde natural malefic planets get the lordship of benefic houses, there will be hurdles and mental worry before getting success. 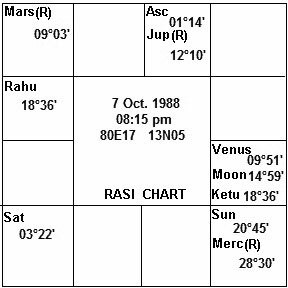 If retrograde natural benefic planet get the lordship of 6,8,12 houses, it is difficult to get good results. If retrograde natural malefic planets get lordship of 6,8,12 houses, there will be repetition in the work done, hurdles, and the results will not be favourable. If a strong malefic planet is situated in the ascendant or 7th house of Prashna, then the questioner is shrewd. 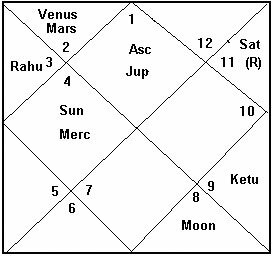 If Moon is situated in the Ascendant of Prashna, and Sun, Mercury and Saturn are situated together in any one of the Kendra (1, 4, 7, and 10), he is putting a fake question. If Moon is in the ascendant, Saturn is in Kendra, and Mercury is combust, then the questioner is not asking the question, reliably. 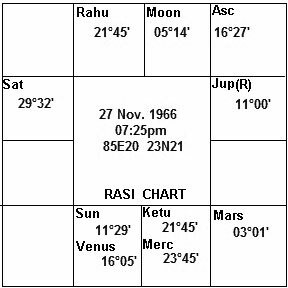 If Mars and Mercury have their full aspect on Moon, then the questioner is asking the question for enjoyment purpose only. If Moon and Jupiter have their inimical aspect (Tajika aspect planets aspecting from their Kendra houses) on the Ascendant lord and 7th lord, then the questioner is asking the question for entertainment only. 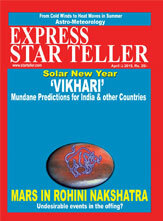 If Mars is the lord of 6th house and is situated in the ascendant with Saturn, then the questioner is doing mischief. 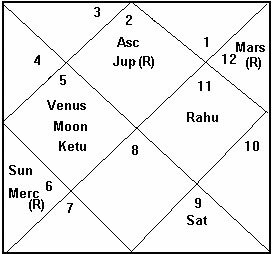 If Moon and Jupiter have their friendly aspect on the Ascendant lord and 7th lord, then the questioner is simple-natured. If auspicious planets are situated in the Ascendant or aspected by them, then the questioner is a pleasant person. If auspicious planets are situated in 7th house or aspected by them, the questioner will not be cunning. If Moon and Jupiter are in Kendra and Trine house, in friendly sign or Mercury and Jupiter are in the ascendant or 7th house, then the questioner is easy natured. 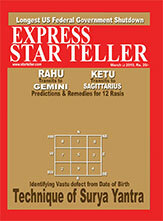 If Mars is aspecting Moon and Mercury, then the questioner is examining the knowledge of Astrologer. To practise Prasna, these Tajika Yogas need to be known. If a faster planet with less longitude is backwards of a slower planet with a greater longitude, Ithasala Yoga is caused. If the latter planet is ahead of the former by a minute, it is a complete Ithasala or Muthaseela. When a faster-moving planet is ahead of a slowermoving planet by one degree, Easarapha or Musaripha is caused. This is an unfavourable combination. When there is no mutual aspect between two planets, but a 3rd planet which is faster, is in between, in aspect with both, then this faster-moving planet transfers light from the other faster planet to slower one. This is Nakta Yoga. When there is no aspect between two lords and a slower-moving planet is in-between these two lords, involved in aspect with to them, and then the slowermoving planet will transfer light from the other faster of the two lords to the slower. This is Yamaya yoga. When there is Ithasala between two planets and the Moon is also involved in Ithasala with one of the planets, the resulting yoga is Kamboola. Case-study 1: Will Chennai win the ISL in 2018? Indian Super League (ISL): Debutants Bengaluru FC vs Chennaiyin FC in the final of the 2017-18. Match date was 17/03/2018, time was 8PM. Just 15 minutes before it came to my mind whether Chennai will win the ISL in 2018? Jupiter was retrograde in the Ascendant .In 2015, Chennaiyin FC had won the cup. Whenever a retrograde planet is in the Ascendant, they must be the winner, winning the Cup at least once. Ascendant (Libra) lord and play master, Venus exalted in the 6th, is conjunct with Mercury, the 9th lord. The 11th lord Moon (success) also in 6th, its friendly house. If the 6th house is all right, then win over warfare is waiting. So prediction is Chennaiyin FC will win the ISL 2017-18. Conclusion: Chennaiyin FC wins 3-2. Rising sign is Aquarius-Fixed, Sheersodaya sign. In the Ascendant, 7th sign Leo's lord, the Sun is posited, making the change to the Fixed sign's nature. As it is Sheersodaya sign, victory of BJP is possible. 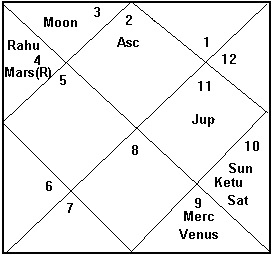 Moreover, Mars is aspecting by its 4th aspect, sitting in its own sign, whereas Saturn is aspecting by its 3rd aspect. So, the prediction was that BJP will win in Tripura Assembly election. BJP did win the Elections with comfortable margin. Case-study 3: "Whether baby will be delivered in normal manner?" The lady was pregnant. She wants her baby's birth to be natural and not Caesarean. The rising sign is Gemini, 17047". That means it crosses 150. Saturn's degree is 13041". So no natural malefic is aspecting. Mars' degree is 0.24" - far away from Saturn.Consequently, predictions of the birth of the baby is to be normal. Conclusion is that, the birth of the child will be in natural manner. They did not go for Caesarean surgery. Case-study 4: Will the lost boy return? A lady' son was lost. She informed me at 2 PM. The son, was lost from her village Sundarbon, West Bengal, India. Rising sign is Scorpio--fixed sign Sheersodaya. Rahu is aspecting the Scorpio. Ascendant lord Mars is retrograde. Seeing the Sheersodaya sign and the Moon in the 10th, it was predicted that the boy would come back. Moreover, the Ascendant lord Mars is retrograde. Retrograde lagna lord indicates Safe Return. The boy did return. The 15th Karnataka Assembly election was held on 12th May 2018 in 222 constituencies.BJP wins 104 seats, Congress got 78 and JD(S) got 38 seats. Congress and JD(S) make the post-election alliance. The Governor took the decision on inviting the BJP, as a single largest party and gave 15 days' time to show the majority, on 17th May 2018. The Congress approached the Supreme Court. Supreme Court allotted only 48 hours i.e. 19th May 2018. 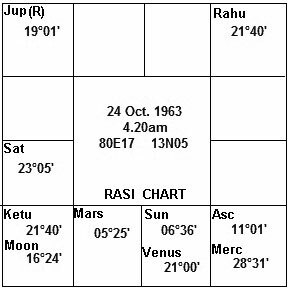 The rising sign is Virgo 22057", dual sign, Sheersodaya. i.e. it will act as Movable sign. Retrograde Saturn is aspecting Virgo from 4th house. Saturn(R) is also aspecting, Gemini, the 10th house, where Venus is posited. It means Coalition in the Government. Sheersodaya, dual sign, acts as a movable (because the 150 rule).Whenever a retrograde planet aspects the Ascendant, whose term has been finished, will get the power again. The prediction is that the Congress-JD(S) alliance will form the Government. The occurrence was that, Congress-JD(S) alliance formed the Government. Case-study 6: Will Awami League win in the coming Bangladesh General election in Dec'18? (Received this precise prediction during Sept.2018, very much ahead of the Election- Editor). The rising sign is Libra, Sheersodaya, Movable sign. In the rising sign, there is natural benefic planet Venus (57') is there. Libra is its Mooltrikona sign of Venus. Jupiter 23020' is also there. Then Ascendant is 5017'. 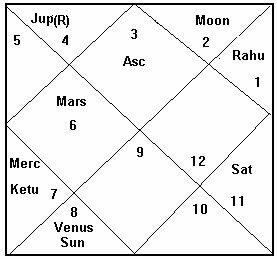 In the 10th, there is Rahu (law enforcement), aspected by Mars (Police). That means Awami League will win the election, with the help of Police force.